Searching for fonts that look like Bickham Script® Pro 3? Look no further! 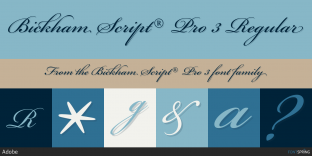 Here you will find fonts that look like Bickham Script® Pro 3. Use the selector above to match other fonts in the family. 50% off until Feb 14th!